A service dog helps individuals perform tasks they cannot do for themselves because of a disability. The Americans with Disabilities Act governs the use of service dogs in public places. Persons with disabilities are allowed to take their service dogs into public places normally prohibited to dogs, such as on public transportation, and in public buildings, stores, theaters, hospitals, restaurants, etc. Service dogs are not pets. Each service dog has been trained to perform specific tasks for his/her owner. When with their owners in public, service dogs are working, and it is inappropriate to pet them or try to distract them from their jobs. They have been trained to ignore distractions and stay with their owners even when not on a leash. A therapy dog is a trained to interact with people other than his/her handler to make those people feel better. 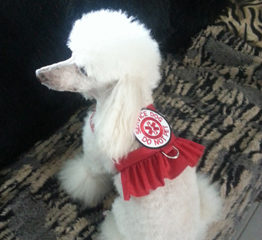 A therapy dog and his handler (usually the dog's owner) visit facilities such as hospitals, retirement homes, nursing homes, schools, libraries, and disaster areas. Therapy dogs even serve to help relieve stress in passengers at some airports and for college students taking finals at some universities. A therapy dog is there to be petted and provide comfort and affection, and has been trained to behave in public situations. Although therapy dogs are often certified, they ae not given public access rights the way service dogs are; they are allowed into places like hospitals, skilled nursing facilities, and libraries only by prior agreement with the facility. An emotional support dog provides the therapeutic benefit of companionship to an individual with a mental or psychiatric disability. These dog do not need specialized training, and they are not granted access to places of public accommodation. In the US, disabled people with emotional support animals are exempted from certain rules against having animals in most housing and travel situations. The owners of emotional support animals must meet the federal definition of disability and must have a letter from their healthcare providers stating that they are being treated for a disabling condition and that their emotional support animals improve or benefit some component of the disability. Service Dog or Therapy Dog? A Service Dog performs a needed service for an individual who benefits from canine assistance in dealing with a handicap. Typical Service Dog functions include seeing eye, hearing assistance, and emotional support. A Therapy Dog performs visits to nursing home, hospitals, schools and libraries as "read dogs" for children. Our Gabriella is both! She is a Service Dog for Sherry. And she's a wonderful Therapy Dog as well, offering comfort to those living in nursing homes and encouragement to children learning to read.